Studies on monkeys have revealed clues about the evolution of language. 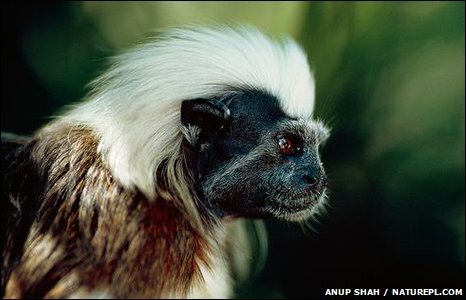 In the journal Biology Letters, researchers said that cotton-top tamarins are able to spot if the order of syllables in a word is "wrong". They familiarised the monkeys with two-syllable terms, and recorded their reaction to words that were not consistent with that syllable pattern. The team says the work illustrates how many animals use patterns that have become intrinsic to human language. And this provides evidence of the "non-lingual" origin of certain aspects of language, the group told BBC News. In the experiment, the monkeys were played a series of different words that all shared either the same first syllable or second syllable. The idea was to investigate the origins of the prefixes and affixes used in many languages to indicate tense. In English, for example, the past tense of a verb can be composed using the suffix "-ed" - "walk" becomes "walked". The monkeys were not trained to respond to specific words, but they were familiarised with a pattern - a particular prefix, or a suffix. "In the prefixation condition, they heard 'shoy-bi', 'shoy-la', 'shoy-ro' and so on," explained Ansgar Endress, lead author of the study. "The idea is that they get used to the pattern if you play it long enough." The "suffixation" group heard words with a changing first syllable, this time with the suffix, "shoy", kept consistent - such as "bi-shoy" and "la-shoy". The team played recordings of these "familiarisation" words to the animals for half an hour. The following day, the monkeys were tested. The researchers played them "new" words that were either consistent with the pattern they had heard before - with "shoy" in the right place - or inconsistent with the familiar pattern. "We simply measured how often the monkeys looked to the speaker when we played the items," said Dr Endress. "If they got used to, or bored by, the pattern, then they might be more interested in items that violate (it) - because they are something new - than in items that are consistent with the pattern." Marc Hauser, who was also involved in this study, told BBC News that the results showed how human language had incorporated memory processes that were not "language-specific". "Simple temporal ordering is shared with non-human animals," he said. "This has an important role. In bird song or whale song, for example, there's a temporal ordering to the notes and that's critical for communication." And it goes beyond that. "In primates, this ordering is vital for learning," explained Professor Hauser. "In tool use, primates learn from each other that you do this first, then you do that, then it's that." "As a child learns to use the past tense," he said, "they may generalise and use a suffix wrongly, but they will never generalise in the wrong direction. "You never hear them say ed-walk instead of walked."